To order "Soot," please scroll down to view ordering information OR click here (or the book pic). HOW TO ORDER "Soot": $7 each plus $1 shipping for 1-2 copies or $2 shipping for 3-5 copies; send via Paypal to sevenkitchens@yahoo.com or mail a check or money order payable to Ron Mohring at Seven Kitchens Press, PO Box 668, Lewisburg PA 17837. Each chapbook is hand-trimmed and hand-tied; please allow ten days for delivery. 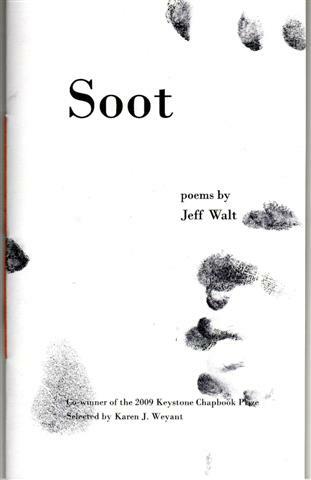 If you are in Honolulu, copies of "Soot" are currently available at The Contemporary Museum's shop.